For any occupation that requires standing on your feet for long periods of time, sometimes 8-12 hours at a time, it takes a toll on your legs. But this becomes especially true for those in the medical field. Nurses, doctors, caregivers – they’re continually walking throughout the hospital, going from patient to patient, and giving treatments and care to individuals. With all this in mind, things like swelling, varicose veins, and edema become more apparent after a shift or rotation. One of the things you can do to help ease the burden and improve the recovery process is wearing a pair of compression socks. For the uninitiated, this might come as a surprise that something as simple as this would help, but trust me, it does. As for our top choice for compression socks, we decided to go with something that encompasses all the attributes you’ll need to recover efficiently during and after work ‒ design, fabric and graduated compression levels. We decided to go with the compression socks by Physix Gear Sport due to its high-quality weave, stitching, as well as the graduated compression levels being suitable to help recovery from mild-moderate varicose veins and swellings. We felt it was the best overall pick to help deal with everyday problems nurses and doctors deal with on their legs on a daily basis. But for every winner, there is always a runner-up. If you aren’t satisfied without top choice or are looking for more options, I would also recommend the Danish Endurance Graduated Compression Socks as they have a somewhat lower graduated compression level (18-21 mmHg). Although not as strong as our top choice, comfortability becomes a factor when you’re going to be on your feet for hours at a time. If you’re unsure of which compression socks would be good for you, our go-to choice that is the best for both men and women nurses would be these socks by Physix. Many people, including myself, are huge fans of the overall construction and design of the socks. From the moment you put them on, you can feel the high-quality double-stitched weave design and antibacterial polyester fabric contour to the shape of your feet. Any nurse or medical practitioner would appreciate the attention to detail they put into the construction of these particular socks. The ergonomic design combined with the 20-30 mmHg graduated compression levels allows the compression process to occur efficiently. The 20-30 mmHg range may seem a little bit on the higher side for most people, but it is the ideal compression level for someone such as a nurse or a doctor who is constantly walking about. It’s perfect to combat mild to moderate levels of edema, spider veins, and swellings that may develop. You could always opt for lower level graduated compression socks if you find yourself not needing the stronger tightness, but if you want maximum benefit from a pair of socks, you can’t go wrong with the Physix Compression Socks. They’re the definition of both form and function that are the best compression socks any professional nurse could ask for. We picked these socks by Danish Endurance in the same vein as our top choice: they were designed with a combination of both comfort wear and functionality in mind. The difference here is that they are at a slightly lower graduated compression level of 18 – 21 mmHg. These would be better suited for those nurses who may not be as active on their feet and feel they won’t need the extra compression tightness. Since you’re not on your feet as much as a nurse who may be constantly standing or walking, your symptoms of varicose veins and swelling will be less severe. 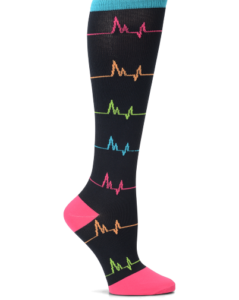 Therefore this graduated compression range will still be capable of promoting an efficient recovery process as long as it corresponds to the severity of your symptoms during and after a shift. If you decide to opt for these compression socks, you will still get the entire package of comfort, recovery, and durability in a single pair of compression socks. The only real difference here is the graduated compression levels. 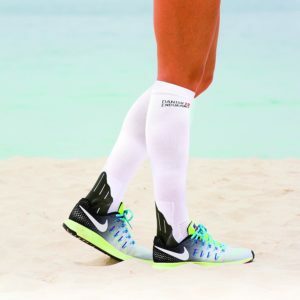 Although we already listed out a few of our top picks for overall choice, the rest of the compression socks we’ve listed are also the best in their respective aspects: graduated compression levels, bang-for-your-buck, length, and bulk-buying. Depending on what you consider most important to you, it’s best to pick compression socks that have a bigger impact for you. Whether that be budget socks that won’t break the bank or maybe you want higher graduated compression levels to deal with more moderate to severe edema and varicose veins. Whatever the reason, it’s always good to see if there would be a better fit for you and your personal situation. You read that right, these compression socks are in the 30-40 mmHg range making them the strongest in terms of graduated compression levels among all the socks on this list. For the normal wearer these would feel super constricting, but for a nurse that has several shifts/rotations a week, it may be the push you need to be consistently recovering. I would only recommend these if your symptoms of edema, varicose veins, DVTs, and ankle ulcers are severe, it may cut off circulation for some individuals. I always urge people to double check with a doctor if you’re unsure, and since you’re a nurse, it should be easier to get a second opinion from a fellow colleague before making this jump. Another option is to work your way up to this compression level by wearing socks in the 15-30 mmHg range first. If you feel our top picks mentioned previously aren’t cutting it and you’re still experiencing pain or swelling while wearing those socks, then you can most likely upgrade to these compression socks. You have to pick the corresponding graduated compression for your own symptoms to get the best individual recovery experience. While these are the strongest, it does not necessarily make it the best for you. If you wanted bang-for-your-buck compression socks, you get bang-for-your-buck compression socks. Soorverki compression socks come in a pack of 6 pairs for a relatively cheap price you can’t really beat. 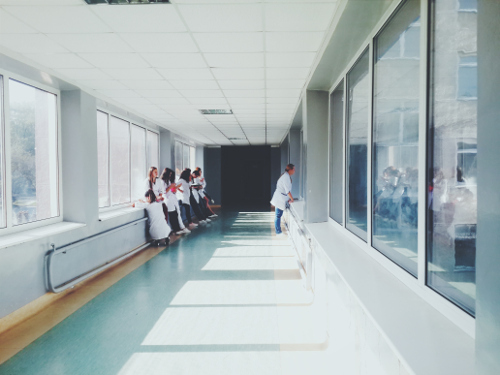 While individually it doesn’t compare to other compression socks on this list, it is still capable of providing that much-needed compression for nurses who find themselves either sitting most of the shift or in a resting position. They are a still a great way to experience light/mild symptoms with its 15-20 mmHg gradient compression for swollen calves, edema, or spider veins. But the true beauty of buying on a budget is you have several compression socks to rotate through the week during different shifts. With 6 pairs, you almost have one for every day of the week. I feel this should be more than enough for the number of shifts and rotations you’ll have in a week. In addition, I think it’s a great alternative if you aren’t quite ready to try one of the more expensive options on this list. These socks are excellent as an entry level compression sock for those who want to try out a bunch before you dedicate more time or on a budget and don’t necessarily need higher end compression socks at the moment. They come in various colors and packages so you don’t have to feel like you’re wearing the same thing every day. That’s something you won’t get from many of the other compression socks on this list. Just to preface, this was an entirely subjective and opinionated choice, it may be different for you, but after getting feedback from other individuals, as well as myself, we decided these compression socks by Blitzu got the job done in the comfort department. The main reason for this comfort we believe is the unique design implementation that they infused into the sock itself. The manufacturers managed to combine kinesiology tape with the fabric of a regular compression sock. Incorporating this tape into the fabric is a smart move on their part because it provides increased and maximized stimulation to help improve the recovery process. With the weave stitching construction and kinesiology tape, it is a step above other compression socks in terms of comfort and unique design. This will ensure you’re getting the ideal recovery you’ll need for long-term wear. 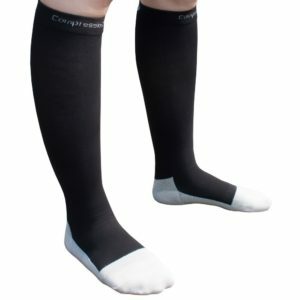 While these compression socks are mainly targeted for athletes, I believe nurses such as yourself would benefit tremendously from the comfort. If you’re going to be wearing something for long periods of time, especially during a long shift, I would want something to move with me in each step I make while working. With “nurse” in the name, you can guess that these particular compression socks are made directly for medical professionals. 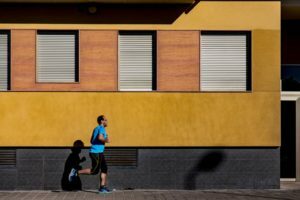 If you already have experience with compression socks, you might feel that some of the mild to moderate levels of compression might be too tight. There have been accounts of some people having red and swollen legs after wearing different socks. If you’re worried and want something on the lighter side, I would recommend these gentler compression socks. While not as strong compared to some of the other socks on this list. It is still made with that combination of recovery and comfort. The large coverage area of the socks applies the gentle tightness throughout your calves and ankles. It will help relieve most of the muscles and joints in the leg. In addition, it makes a perfect fit for women with bigger/larger calves and feet. They come with unique designs and patterns on the socks. Most of the other socks on this list only come in solid basic colors. If you’re not a fan of the simple solid colors and want something with more character or expression, then these are a good way to add a little flair while working. This category is another subjective and opinionated choice that was made from a combination of our team’s personal experiences with the socks. 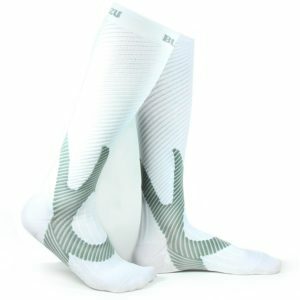 The knee-high design has a larger coverage area on the entire leg to allow the gradient compression to be applied to that entirety of the leg. 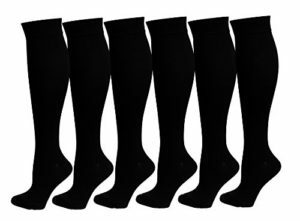 It’s perfect for men and women nurses to achieve that signature and comfortable knee-high comfort. Added benefits include the moisture regulation and mild compression (15-20 mmHg) to prevent the feeling of sweaty feet while still stimulating recovery for aching ankles and general soreness in the foot. This is all thanks to the nylon material the manufacturer infused into the stitching and construction of the socks. There are several added benefits it provides, including the ones mentioned above, such as increased durability, stretch, sweat-wicking properties, and antibacterial material. These are great all-around socks that come in a pack of 6 allowing you to have a pair for almost every day of the week. Whether you’ve already made a decision of which pair of compression socks to buy or are still on the fence, there is an ideal compression sock for everyone. Some details and specifications to keep in check during your buying process include the material, sock count, and sizing. Sizing is one of the most important things to make sure you get right. Each of the compression socks listed has a corresponding sizing chart, but some manufacturers have different sizing standards. Take a tape measure and wrap it around your ankles or calves (depending on the manufacturer’s specifications) and take that circumference measurement and match it the sizing chart. As for sock count, some people misunderstand if they’re getting single or multiple count socks. They come in pairs usually and the higher quality socks come in individual purchases unless listed otherwise. Try not to get duped by the product pictures because sometimes they are misleading. Last but not least is the material itself. 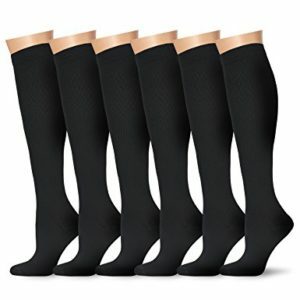 Most compression socks either come in a polyester or nylon variant that has similar properties. We wrote a post outlining the differences in the material to give you an accurate breakdown of what will fit for you. If you’re not satisfied with any of these compression socks, feel free to check out our best overall compression socks list for more options.